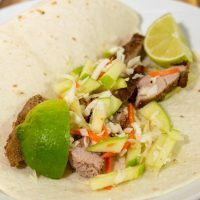 Smoky pork tacos with sweet apple slaw is an easy, delicious dinner. The combination of flavors and textures is sure to be a hit! It’s Day 5 of AppleWeek! Have you checked out the giveaway prizes and entered to win yet? If not, head over to Monday’s post to read about the prize packs from our generous sponsors and fill out the entry form. 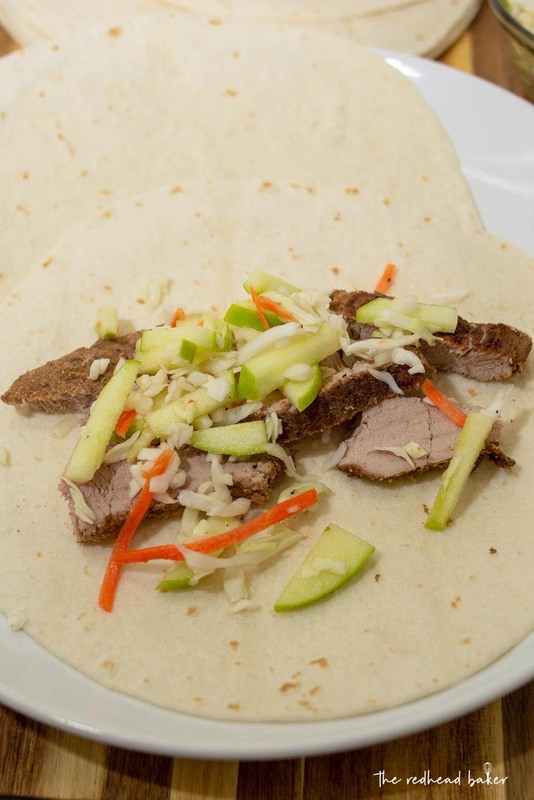 Today’s recipe is a delicious dinner recipe that pairs smoky pork tenderloin strips with tangy-sweet apple slaw. I used my new Swiss Diamond non-stick saute pan to sear my pork tenderloins before finishing them in the oven, then topped them with an apple slaw. I have been using this pan A LOT since I received it a few weeks. It’s giving my stainless steels and cast-iron pans a run for their money! It browns meat just as nicely as my other pans, and it’s SO easy to clean. I haven’t found any foods yet that stick to it, thanks to the diamond particles in the coating. 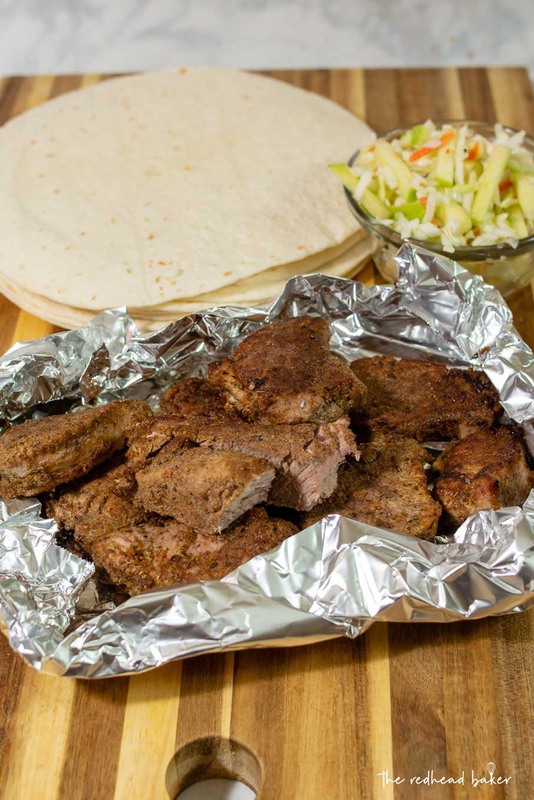 The pork is coated in a flavorful spice mixture of cumin, garlic powder, onion powder and chipotle chili powder. The chipotle chili powder gives the pork a smoky rather than outright hot-and-spicy flavor. The apple slaw is so easy to make because it starts with a pre-shredded bagged mix from the grocery store. Then you add very thinly sliced apple sticks, and dress the slaw with a mixture of cider vinegar and lime juice. This slaw complements the pork tacos really well. It can be made up to a day ahead of time, and only gets tastier as the flavors of the slaw meld together and infuse the apple slices. Finally, add something creamy to your tacos, either avocado slices or a dollop or two of sour cream. Tacos are a weekly staple in our house, and I love that we have a familiar dish with a slightly new flavor to add to our rotation. In a large bowl, toss slaw ingredients. Refrigerate, covered, until serving. In a bowl, mix the spices together. Place the pork medallions in a large ziptop bag, add the spices, and shake until pork is well covered. Heat 2 tablespoons oil in a 4.3-quart Swiss Diamond non-stick saute pan over medium heat. Add the pork pieces and brown a few minutes on both sides. Don't crowd the pan -- cook in batches if needed. 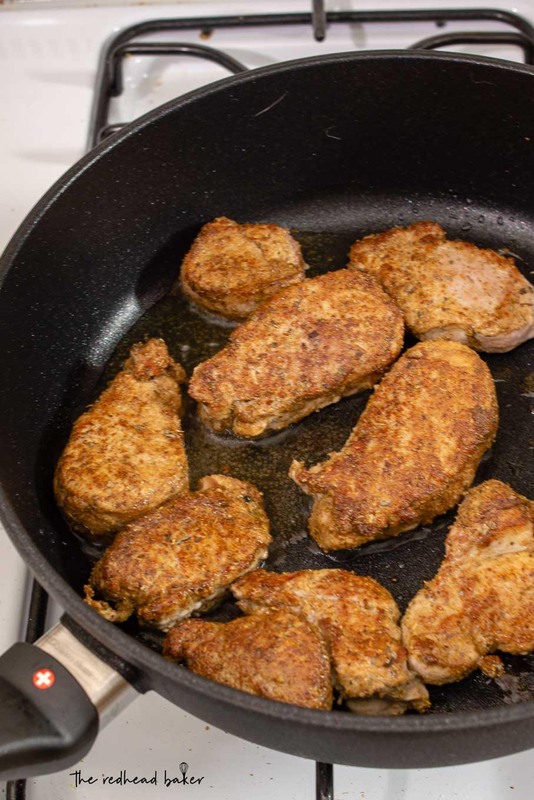 Once all are browned, transfer the pan to the oven and continue cooking the pork another 20 minutes, or until the medallions reach an internal temperature of 145 degrees F. Let cool about 10 minutes. Cut the pork medallions into strips. 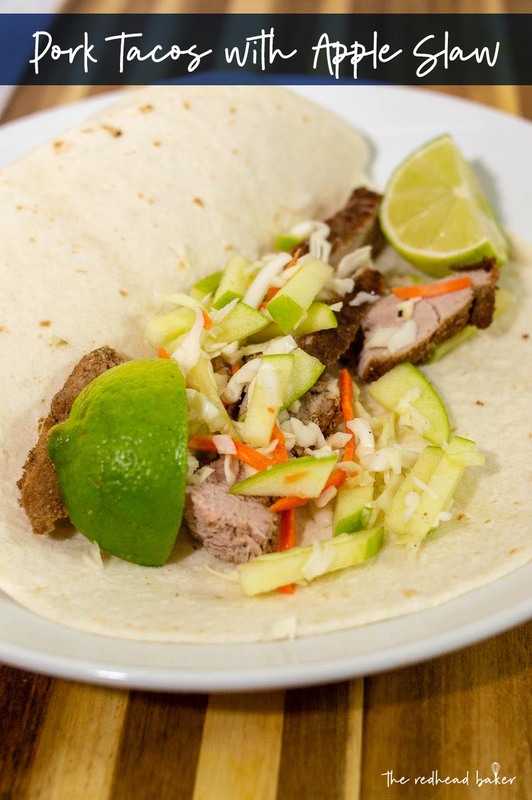 Layer a few strips of pork onto a flour tortilla, and top with some of the apple slaw and 2 slices of avocado. These are making an appearance next Taco Tuesday.